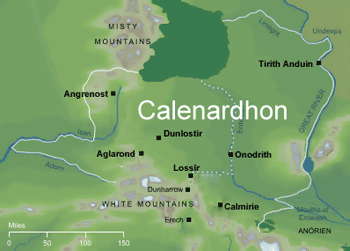 Calenardhon is a vast region of plains and rolling hills north of the White Mountains and west of Anórien; the name translates from Sindarin as "green province". It never had a large population during the early Third Age due to its remote location, and the Great Plague left the province virtually deserted, with many people migrating eastward. Forts that were built along the line of Anduin from Emyn Muil to the inflow of Limlight to guard the passage of the river are manned by the indigenous people of Calenardhon. Forty years after the Disaster at Gladden Fields in III 2, Captain of Gondor Abâruzîr Astirian led a force of 20,000 troops northwards into the country known by the Gondorians as Calenardhon, subduing local tribes, laying roads and building fortifications as they went, as recorded in the Chronicle of Gondor. The success of this initial campaign culminated in the deaths of up to 10,000 Dunmen at the battle of Dunharrow. 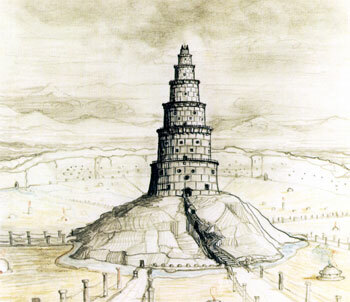 Despite such victories, and the construction of mighty fortifications like those at Isengard (Angrenost), Isenwall, Aglarond and Calmírië, Gondors' control north of the White Mountains remained far from complete throughout their occupation. Contact with the natives was dominated by intermittent military episodes and skirmishes, and the overall impact of Dúnadan civilisation was far less than elsewhere in Gondor. Dúnadan settlers build homesteads along the Great West Road, where they could count on the protection of the forts. Many of the first settlers were retired soldiers who had served at Angrenost or Aglarond; after fulfilling their military obligations, they were granted lands in the country they had been protecting. 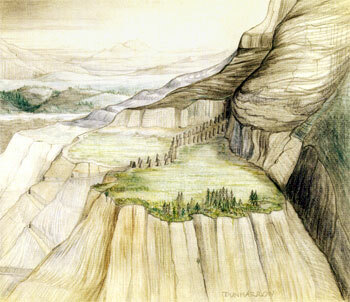 Unlike lands in Anórien and Ithilien, Calenardhon was directly granted by the King to men who promised they would bring the grasslands under cultivation. Grazing rights and lands of lesser richness in the Emnets and the Wold were granted on the same terms to indigenous Dunmen subjecting to the rule of Gondor and Rhovanic peoples immigrating from the Vale of Anduin. Dúnedain of Calenardhon, who owned the rich grasslands, claimed to have descended from that portion of the Faithful who had long ago, in Númenor, enriched the fields of Orrostar by planting grain, and who had filled the pastures of Emerie and Hyarrostar with flocks of sheep. Shepherding soon grew to be the most important industry in Calenardhon, although it could not compete with Anfalas or Cardolan with its great textile mills of Tharbad. Dúnedain also introduced the use of steel-tipped plow, which permitted rapid population growth. 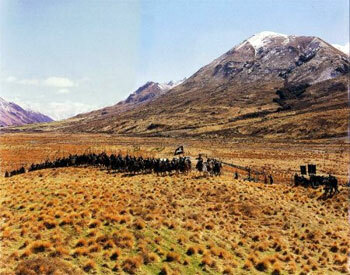 Most of Calenardhonian grain was exported to feed Gondor's armies.